The Nvidia Shield (stylized SHIELD), also known as the Shield Android TV or Shield Console, is an Android TV-based digital media player produced by Nvidia as part of its Shield brand of Android devices. First released in May 2015, the Shield is marketed by Nvidia as a microconsole, emphasizing its ability to play downloaded games and stream games from a compatible PC on a local network, or via the GeForce Now subscription service. As with all other Android TV devices, it can also stream content from various sources using apps, and also supports 4K resolution video. It has been distributed in models with either 16 GB of flash storage, or a 500 GB hard drive, the latter branded as Shield Pro. In 2017, Nvidia released a refreshed version of the 16 GB Shield, which has a smaller form factor that drops MicroSD and infrared support, comes with an updated controller, and is otherwise identical in hardware to the original model. The Shield utilizes Nvidia's Tegra X1 system-on-chip, based the ARM Cortex-A57 CPU and Nvidia's Maxwell microarchitecture GPU, with 3 GB of RAM. The device supports 4K resolution output at 60 FPS over an HDMI 2.0 output, with support for HEVC-encoded video. The Shield can either contain 16 GB of internal flash storage or a 500 GB hard drive, expandable via microSD card or removable storage. Models with a 500 GB hard drive are branded as Shield Pro. It contains two USB ports. For internet connections, it supports gigabit Ethernet and 802.11ac Wi-Fi. The console ships with one wireless controller; a remote with voice control and a headphone jack is sold separately. The Shield runs Android TV; games optimized and ported for the device are offered through a separate Shield Store app. 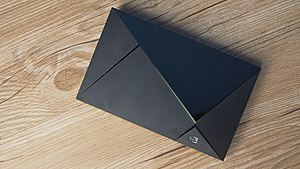 The device can also stream games through Nvidia's on-demand subscription cloud gaming service GeForce Now (formerly Nvidia GRID), and from a local computer using the GameStream function of supported Nvidia graphics cards via the GeForce Experience application. On January 16, 2017, Nvidia announced Shield Experience Upgrade 5.0, which is based on Android 7.0 "Nougat". It adds software features from the updated 2017 model, including HDR support for 4K video, new apps (including Amazon Video), SmartThings integration, Google Assistant support, and a new Nvidia Games interface. Google Assistant support requires a new iteration of the Shield Controller.In June 2018, Nvidia released an update that included Android 8.0 Oreo as well as an update to the user interface. In January 2017, Nvidia unveiled a refreshed version of the 16 GB Shield. It has a revised form factor with a smaller size but no microSD slot, and is supplied with Shield Experience Upgrade 5.0. A remote control is now bundled, as well as an updated controller with an always-on microphone. The 2017 model contains the same Tegra X1 system-on-chip as the 2015 model. The 2017 Shield replaced the original 16 GB version. Nvidia continues to market the larger, 500 GB Shield Pro model. Due to video game censorship and Internet censorship in China, game services are unable to operate normally in mainland China. Nvidia chose to cooperate with iQiyi, a video content operator in the Chinese mainland, to sell the Chinese version of the SHIELD TV. It's said that these games run on SHIELD TV as GameCube/Wii emulator. ^ Smith, Ryan. "NVIDIA's SHIELD Console Becomes SHIELD Android TV". Anandtech. Retrieved 5 May 2017. ^ "NVIDIA SHIELD And SHIELD Pro Review: Easily The Best Android TV On The Market, But Don't Toss Out Your Game Consoles Just Yet". Android Police. Retrieved 5 May 2017. ^ a b c "NVIDIA Announces SHIELD Console: Tegra X1 Android TV Box Shipping In May". Anandtech. Retrieved 4 May 2017. ^ a b c "Nvidia's new Shield TV is a refined media box, but it's still best for gamers". The Verge. Retrieved 5 May 2017. ^ a b "NVIDIA Shield TV review: the best Android set-top box you can buy". Engadget. Retrieved 4 May 2017. ^ "NVIDIA's GeForce NOW - GRID Cloud Gaming Service Goes the Subscription Way". Anandtech. Purch, Inc. Retrieved 4 May 2017. ^ "Nvidia finally launches GeForce Now cloud gaming for Shield set-top console". VentureBeat. Retrieved 2016-07-18. ^ "The updated Nvidia Shield is now available". The Verge. Retrieved 5 May 2017. ^ "Old Nvidia Shield TV will also get Google Assistant in update". Pocket-lint. Retrieved 5 May 2017. ^ "NVIDIA Shield TV Android 8.0 Oreo update rollout is back on!". Android Central. 2018-06-27. Retrieved 2018-07-18. ^ "Nvidia Shield (2017) review". Techradar. Retrieved 5 May 2017. ^ "SHIELD影游一体机 常见问题". NVIDIA SHIELD. Retrieved 28 June 2018. ^ "SHIELD Developer OS Images". NVIDIA Developer. Retrieved 28 June 2018. ^ "Chinese Nvidia Shield TV with Nintendo games may actually be running a GameCube/Wii Emulator". XDA Developers. Retrieved 28 June 2018.